Wondering what to cook this time of year? Head to your local farmers market and select an array of beautiful vegetables. Make a stuffing of sautéed vegetables, meat, and rice (or bread crumbs), and voilà!, you have a complete meal that pleases adults and kids alike. Similar in concept to meatloaf, my version of this Provençal classic is heavier on the veggies and more stylish than its loaf-shaped cousin. Endless variations can be created from this recipe. Below lists summer vegetables, but equally delicious and satisfying is the array of off-season possibilities with winter squash, such as butternut, acorn, delicata. 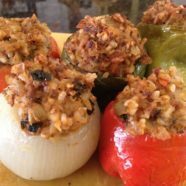 The stuffing itself can be varied to include other vegetables, meats and grains – wild rice makes a lovely addition, as does a small amount of buckwheat kasha. 1. Preheat the oven to 350ºF. Hollow out the 14 vegetables, including the 2 onions; reserve the insides of each vegetable separately (except peppers) to sauté along with the other vegetables for the filling. 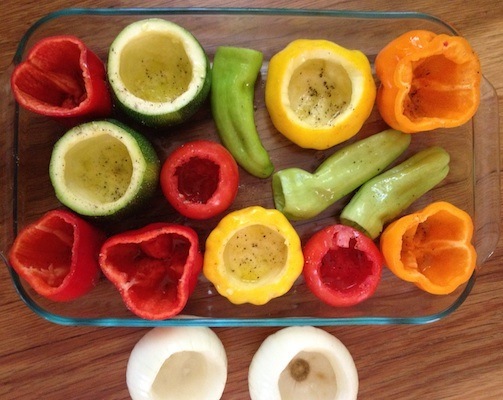 Drizzle the inside of each vegetable (except onions) with olive oil; and sprinkle with salt and pepper. Bake all vegetables in the oven (except onions), face up for 20 minutes. 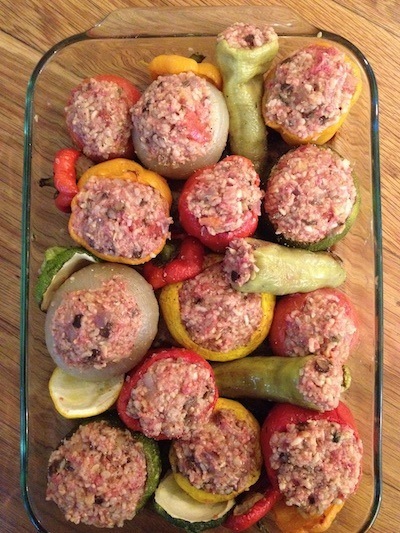 Remove tomatoes; continue baking peppers and zucchini for another 20 minutes. 2. Bring a medium pot of salted water to boil; cook the hollowed onions for 20 minutes over a medium-low simmer. Dry roast the cumin and coriander seeds a minute or so until aromatic and golden brown (do not allow to burn), then grind seeds to a powder. 3. Sauté the onion in a skillet with a tablespoon each of the olive oil and butter, stirring often, until translucent; add the celery, bok choy stems, hot pepper, and carrots, cook several more minutes. Add the garlic and ground spices, cook a minute or so until fragrant, followed by the zucchini and tomato from the hollowed out vegetables. Sauté for several minutes until cooked through and nearly all liquid has evaporated; add the boy choy leaves for the final minute or two of cooking. 4. Meanwhile, remove the veggies from the oven. Allow to cool slightly to facilitate handling. 5. In a large mixing bowl, combine the raw meat, cooked vegetables, herbs, seasonings, eggs, and cooked rice. Mix with hands until thoroughly blended. 6. Stuff the vegetables and place upright on an oiled baking dish. Drizzle with olive oil, sprinkle with salt & pepper, and place in oven for 35-45 minutes until filling is set. Allow to set at room temperature 10 minutes before serving. Garnish with chopped fresh parsley, if desired. 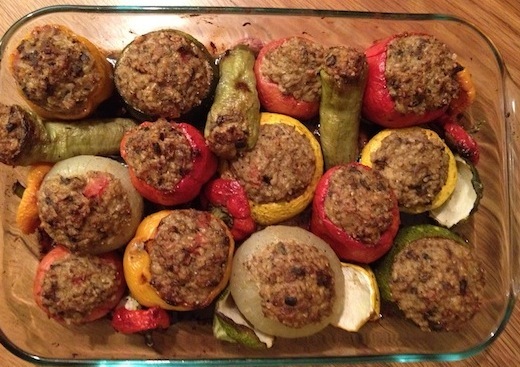 Do-ahead note: Stuffed vegetables are even better left over. To reheat, remove from fridge 1 hour prior to serving; allow to set at room temperature 30 minutes. Add ½ cup of water to the pan, cover with foil and place in a 300ºF non-preheated oven.